The gold market closed $6.1 lower at $1,578.1 yesterday, and is trading steady around the $1,580 mark today, as investors await the US Non-Farm Payroll figures at 13:30 London time. Any significant boost in the numbers could turn even more buyers away from the precious metal after recent upbeat data. However, if the rate undershoots expectations this could entice the bulls back into the market as the unemployment rate is pegged to the Fed's monetary policy. Historically, loose monetary policy to aid unemployment has led gold to record rallies. Positive news on the US economy easily triggered a recovery for US crude oil futures yesterday, with the market closing $1.00 higher at $91.38. The reassurances from the ECB President Mario Draghi regarding the economic recovery in Europe also supported the energy sector. Last, but not least, a weaker US dollar coupled with a rising stock market accentuated the rise. In commodities spread betting, gold closed at $1,584.2 yesterday, gaining $9.3 and still trading within a narrow range. A stronger dollar and the continued allure of riskier assets weighed on sentiment, with a key resistance level lying at around the $1,585 mark. Nevertheless, investors are keen to see what stance the major central banks will take on monetary policy to aid any weaknesses in their economies. Continued quantitative easing is seen as being good for bullion as this causes concerns about inflation and so investors may buy the precious metal to protect their wealth. The US released its weekly crude inventories showing a larger-than-expected build of 3.8 million barrels, against estimates for a gain of 0.9 million barrels. That triggered renewed selling in US crude, with the market price losing $0.40 to $90.38. Friday's Non-Farm Payrolls figures will be closely watched by energy investors, with bulls hoping for some good news that could turn the current downside trend. Gold closed almost flat at $1,574.9 yesterday, with the metal continuing to struggle for investor interest. The global economy still seems to be on the mend, with many stocks rising to four and a half year highs, and the Dow hitting an all time high. The main supporting factor at the moment is the prospect that some central banks will continue to advocate loose monetary policy to spur growth. Policy meetings are due to be held by the ECB and BoJ and online spread trading investors will be watching them cautiously. Once the Dow moved to a new record high, the feel good factor spilled over into the energy complex, dragging crude oil prices higher. 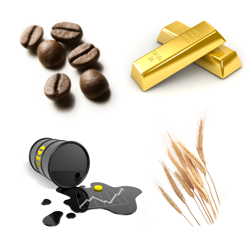 US crude saw a rebound of $0.63 to $90.81 which was also supported by a slightly weaker dollar. Nevertheless, concerns over a potential real estate bubble in China, whose burst could have devastating effects, might keep oil prices in check for now. Gold posted another decline yesterday, losing $4 to $1,574.4, as market participants continued to shift from the precious metal into riskier assets such as equities. However, gold futures rebounded overnight on optimism that central banks around the world will maintain their current loose monetary policies, thus further devaluing their currencies. The price of Nymex crude oil extended its decline yesterday, dropping below the $90 mark for the first time this year, although a late rebound limited the initial losses. Ultimately, Nymex ended $0.54 down for the day at $90.18, with the early plunge being triggered by news of weaker growth in the Chinese service industries. As US President Barack Obama expressed concern about the negative effect of federal spending cuts on employment, fear of inflation was delivered a fresh blow. With the global economy generally getting better it was hardly a surprise to see gold slumping further, losing $4.2 to $1,575.5. As was the case with other commodities, a stronger dollar did not help either. With Europe still struggling and China seeing weaker manufacturing growth, crude oil prices tumbled on concerns that oil demand could suffer. A resilient US economy offered a case for a rise, but WTI crude oil ended the day $0.84 down at $90.92. Safe haven demand for the US dollar also worked against any potential bullish bargain hunting. Gold fell to close at $1,579.1 yesterday, a $17 slide, and is now holding steady around the $1,580 mark this morning. The precious metal has suffered its biggest monthly decline in nine months and its longest run of month-on-month declines in sixteen years. Despite physical gold buying in China, safe-haven inflows to the US weighed on dollar-priced commodities and higher confidence levels continued to attract investors into the stock market. Even though we are seeing increasing signals that US employment is rebounding, their GDP data showed weaker than anticipated growth of 0.1%. As a result, energy investors' sentiment turned negative, pushing US crude $1.04 lower to $91.80 a barrel. Oil prices also saw extra downside pressure after a strong performance by the US dollar. Gold closed at $1,596.1 yesterday, dropping by $18.4, after investors realised that they may have overreacted to the Fed minutes, given Ben Bernanke's reassurance over the monetary easing measures. As the US economy continues to improve, the precious metal is headed for its longest run of monthly drops in sixteen years as people are attracted to riskier assets such as shares. Traditionally, gold is bought as a hedge against inflation, which monetary easing could aggravate, but upbeat economic data is making investors think twice before buying into it and a weaker dollar is also adding downward pressure. Investors are closely watching the fiscal situation in the US as Friday's 'sequester' approaches, with automatic spending cuts being made to government programmes barring any last-minute political deal. Growing confidence in the US economic recovery, which was boosted by yesterday's impressive housing data, failed to trigger a meaningful comeback in the price of WTI crude oil. Instead, the slight rise of $0.12 to $92.80 was pretty unimpressive when you also consider the failure of talks between World Powers and Iran. Gold closed at a nearly one and half week high of $1,614.5, rising $23.1 to continue on its bullish path after further political turmoil in Italy. Spread betting investors are also less concerned that the Fed will slow or cease its central bank stimulus measures after Ben Bernanke strongly defended such policy. This bodes well for the precious metal as the last three rounds of quantitative easing have helped it rally in the past few years. The Fed's focus is now on efficient job growth, which hasn't materialised yet, and so continued QE is on investors' radar in the medium-term, helping to support the price of gold. The price of US crude oil recovered $0.62 to $92.68 yesterday, driven by a lower US dollar and bargain hunting following the slump from $98 seen just two weeks ago. The US is due to release its weekly stockpiles report later today, which is forecast to show a rise of 2.4 million barrels in crude oil inventories. In commodities spread betting, gold closed at $1,593.2 yesterday, up $13.6 since the end of Friday's session. The precious metal saw a resurgence of safe-haven demand as political instability in Italy stoked fears of a resurgent Eurozone debt crisis. Nevertheless, yesterday's almost 1% rebound is expected to be limited due to continuing signs of an improving global economy and concerns that the Fed may slow down or stop its bond purchasing program. Renewed worries about the sovereign debt crisis in Europe also affected crude oil prices yesterday, pushing WTI crude oil $1.07 down to $92.13. Early Italian election results point towards a deadlock, which could make it almost impossible to govern, and so global markets fell on fears of an economic domino effect. Gold closed at $1,579.6 on Friday and is continuing its rebound after bargain hunters came back to the market. Last week it hit a 7-month low, descending to $1,554.2, after a Fed policy meeting caused concern that the central bank might stop or slow its multi-billion dollar bond buying program. Lately, the precious metal has also been under pressure due to an improving global economy that has tempted investors to pile into riskier assets. This morning, the gold spread betting market is holding steady as many are exercising caution during an unpredictable election and its potential impact on the euro. Following a surprise rise in German business confidence, to a 10-month high, the equity markets received a boost which also helped to lift the energy markets. Consequently, WTI crude oil had the chance to recoup some of the previously two days' heavy losses, with the market moving $0.27 higher to $93.39.